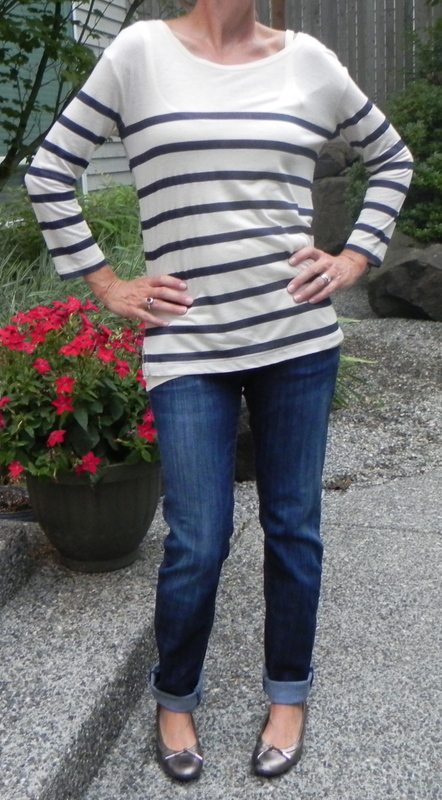 Striped shirt and jeans- an easy and cute outfit. I'm calling foul for this look! produce for the week. It’s a great way to support local farmers, and eat fresh fruits and veggies. During the summer I’d take my kids and they would enjoy picking the berries. Since I’ll be out there doing the picking myself today- I need an outfit that will work. I chose comfy jeans and a striped top. 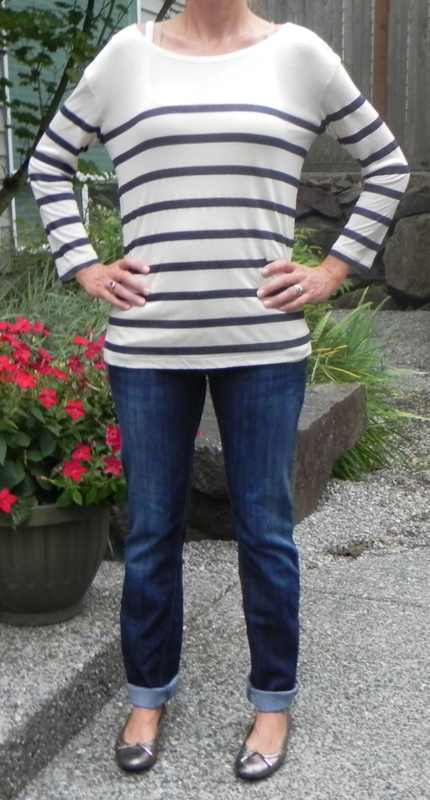 I’m showing 2 versions of a striped top- one that works (in my opinion) and one that doesn’t. On the right my black and white striped shirt looks a little too much like a referee. I also don’t care for the large black cuffs and the fit is tight- and horizontal stripes already make people look wide- in a tight fit this can be made worse. On the left I am wearing a cuter striped shirt. This one has a better fit, a cute boatneck and the stripes are further apart. I’ve rolled my jeans again- I seem to really like that look, and for shoes I went with ultra comfortable- ballet flats. I decided to not wear any jewelry- do you think I should add a necklace? What’s missing? I looked for several months to find a cute striped t shirt- now they are everywhere! This one is from J Crew. No necklace needed for berry-picking. Maybe a cute headband or tie for a ponytail. You are correct- a cute headband is in order. Since I never show my head, you’ll just have to take my word for it! Thanks for your comment- I checked out your blog and my mouth is still watering. Yum! Cute shirt! I would have added a bright belt and half tucked in the shirt (so the back is loose and not tucked). So jealous of your day! I love this suggestion- I’ve been wanting a red skinny belt- so that would be cute. I also considered my leopard skinny belt as an unusual twist. Thanks for your comments! My day at the farm was lovely! Lots of fresh fruits and veggies! Thanks for stopping by my blog! I really like the outfit on the left–very classic, clean and cute. I don’t think it needs much else, especially for berry picking and whatnot. If you wanted to, a necklace would add a lot to it. A scarf would too, I think. Love it! I think red ballet flats would be a cute, fun twist. Ohhh, or orange! Love orange and blue together.